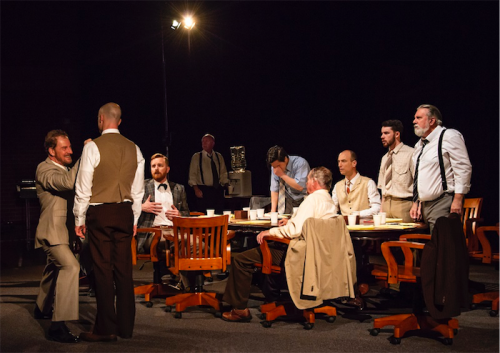 EVERYMAN Theatre’s production of “12 Angry Men” both unlocks and complicates this classic legal drama by planting it firmly in the scripted era of 1950s America. 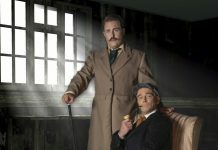 Conspicuously, in this production all 12 jurors deliberating a murder verdict are played by men, contrary to a trend where women are often cast in some of the roles. Producer Duncan Driver, in his notes, says that the all-male cast is vital, because it provides “a set of conditions where different masculinities discourse, interact and clash”. While this is true, the absence of women becomes a commentary on the era of the play. The jurors are an allegorical microcosm of America, with different backgrounds and creeds coming together beneath the benevolent gaze of Eisenhower’s portrait to ensure, despite their flaws, that justice is done. By excluding women from this microcosm, the production constantly reminds us that this is a distant era, if not one that is fundamentally warped by excluding women from power. What the play gains in commentary on masculinity, it loses in feeling remote from the politics of the contemporary world, where women are vital and potent voices. The acting is sublime but restrained, giving the impression that the audience is peeping at these secret proceedings through a keyhole. 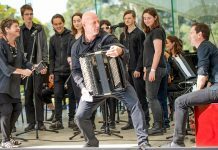 To single out one or two actors would detract from the ensemble conducted orchestra-style by director Jarrad West: uniformly the characters are detailed and nuanced. But with most action taking place with the jurors seated in a circle at the jury table and the audience seated behind them in the round, poor sightlines fragmented the action. I often felt that I only saw a fraction of what the actors were doing, and at one point even forgot that one actor was in the play. The Queanbeyan Bicentennial Hall also absorbed a lot of sound, sometimes taking the edge off the passionate moments. Actors also frequently delivered their lines to only one segment of the audience, limited by the jury table seating. Despite these presentation issues, this is a finely acted and engrossing production, that provides a window on a world both similar to and distant from our own, as well as an engrossing story.